Though it covers the whole history, this entry is best read after Battlestone’s character profile for context. Known Relatives: Unrevealed relatives in Japan. Height: 5’6” Weight: 200 lbs. Though he’s not tall, Kayo is stocky and muscular. He’s also a formidable master of several styles of martial arts (chiefly Japanese styles), armed and unarmed. He’s also a competent assassin, and somehow can pilot alien spaceships (?). Kayo hails from Asaka, Japan. 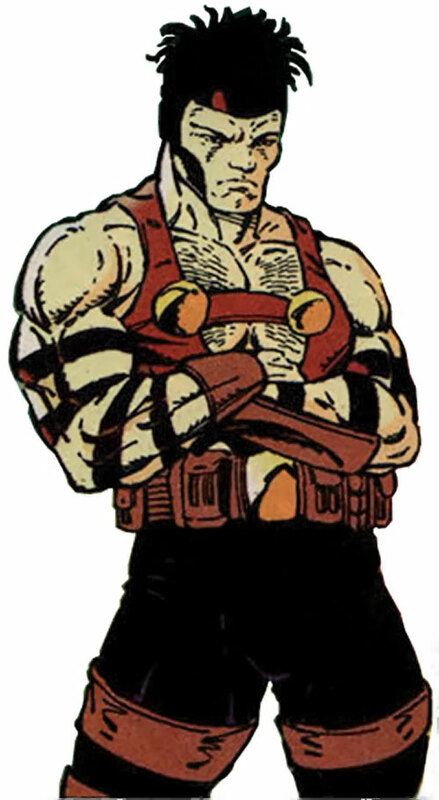 He worked extensively with Battlestone, Lethal and Boone before the creation of Brigade. They were mercenaries specialising in covert operations and wetwork. 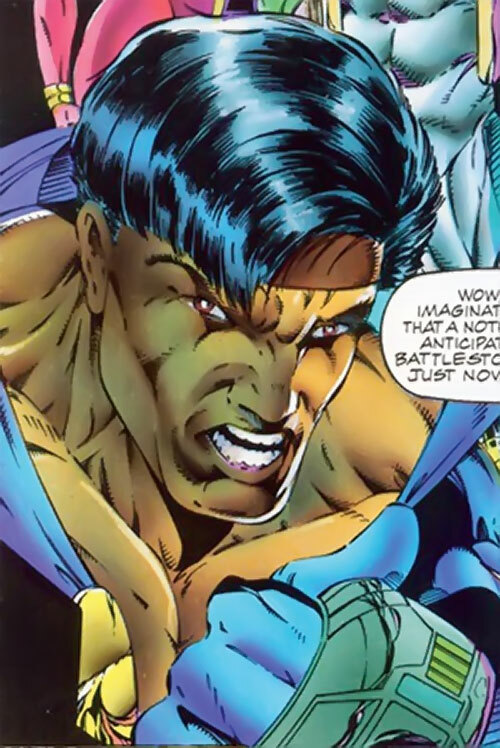 Kayo was effectively Battlestone’s second in command. One of the major missions of the Battlestone/Lethal/Kayo/Boone team was the assassination of the big man of the Japanese underworld, Mr. Soroyama. Though this was originally a covert strike, Battlestone used this feat as publicity within the mercenary scene. He thus considerably raised their profile, rather than continue toiling deep in the shadows. The mercenary quartet parted ways after a botched operation for Jacob Marlowe. Marlowe had hired them to steal a power orb kept within a Youngblood facility. Kayo decided to stick with Battlestone despite his order to leave. But Lethal and — especially — Boone left on poor terms. Months later, Battlestone and Kayo assembled a group of superhumans called Brigade. 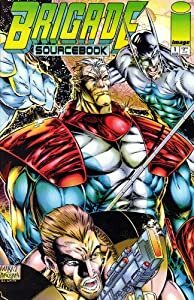 It largely was an attempt by Battlestone to outshine Youngblood, a high-profile government strike team with which he had a convoluted history. They first recruited the Barros brothers (who became Seahawk and Coldsnap). He then found Atlas, Thermal and finally Stasis. The first public case occurred when a high-rise building in Washington was occupied by a team of terrorists. Youngblood had failed to show up. The authorities inexplicably let Brigade storm the building. Though the assault was successful, the bomb went off, demolishing the (thankfully evacuated) building. Furthermore, this case attracted the attention of a super-powerful alien warlord, Genocide. Genocide was looking for adversaries who could give him a good fight. Genocide started rampaging through L.A., not far from the Brigade headquarters. He demanded that the team come out and fight him. With the exception of Battlestone, Brigade did no fare very well. They were losing the fight when everyone, including Genocide, was teleported away to the alien planet D’vor. That left the building which Atlas was trying to save to crash. Accused by an official of having attacked Genocide, a prince of their people, Brigade was condemned to death. Thus, they had to flee from enemy forces. A special team from the local evil alien empire, the Factor, managed to fell Brigade. However, the Earthlings were rescued in the nick of time by opponents to the regime, another super-group called the Birds of Prey. Eventually, Brigade and the Birds of Prey overcame the opposition, at the cost of Atlas’s life. The Birds of Prey gave a spaceship for Kayo to pilot back to Earth. After three months of space travel, they finally made it back to Malibu. Things continued to go downhill. The covert, superhuman assassination team Bloodstrike had been ordered to eliminate Brigade. Thus, minutes after Brigade landed, Bloodstrike’s leader Cabbot (Battlestone’s own brother) shot Stasis dead. 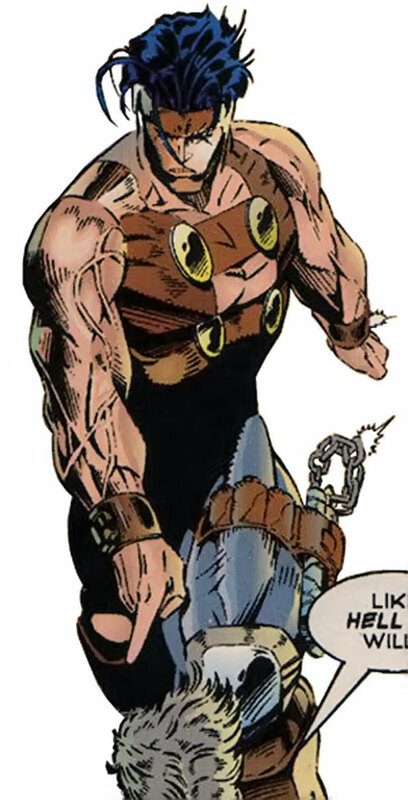 Brigade was taken apart by Bloodstrike. Kayo was outmatched by the superhumanly strong Fourplay. Brigade members but narrowly escaped. Kayo, Coldsnap and Seahawk were badly wounded. The obsessive Battlestone had everyone hospitalised. He then handed Stasis’ corpse over to a secret government project. These guys operated the resurrection technology that had been used on him and on the Bloodstrike members in the previous years. While everybody else but Thermal was floating in healing solution tanks, Battlestone left to recruit more people. He located his and Kayo’s old colleagues, Boone and Lethal. Battlestone convinced them both to help. But it was almost too late. Bloodstrike members had seized the healing tanks with the wounded Brigade members. They also permanently stopped the attempt at resurrecting Stasis. The Boodstrike aircraft carrying Kayo and Seahawk was boarded by Lethal, who rescued both Brigade members. After several weeks to finish healing his broken jaw, Kayo left Brigade for a while. His goal was to put something in his past in order. He resigned and flew back to Japan. Within an hour of Kayo’s departure, Lethal also left. However, Boone stayed with the new team. Kayo’s work in Japan turned out to be wetwork. After he and his comrades had killer the elder Soroyama, his degenerate son had taken over. This had upset the balance of power within the Japanese underworld. Furthermore, some held Kayo responsible for the murder. This meant that his family risked being assassinated as payback. Kayo started taking out the new Soroyama lieutenants (usually as an archer-assassin) and worked his way up the command chain. Unbeknownst to him, Soroyama interests hired Lethal to kill him before he could do too much damage. They also hired the super-ronin Warcry. Kayo was captured and tortured after trying to kill the younger Soroyama himself. But Lethal soon found him and they fled together — which had apparently been her plan all along. Meanwhile, Brigade also learned that Kayo had been captured and flew in. But so did the WildCATs, who had learned that Soroyama the younger had come into possession of an alien power orb. The Soroyama issue was eventually solved, and Kayo recuperated at the Brigade HQ. When Boone later betrayed the team, Kayo was still weakened by the torture. as a result, he failed to stop Boone from fleeing. In the aftermath of Boone’s betrayal, Battlestone’s seeming destruction and learning that Thermal had been writing an expose about the team, Brigade disintegrated. Kayo hesitated to leave. But he came to realise that the new leader, Seahawk, would lead everyone to their death sooner rather than later, even if Kayo stayed. Minutes later the super-assassin from the future, Crypt, came in and killed nearly everyone, including Kayo. In one Battlestone abandoned Brigade to head Youngblood, then came back to kill Kayo and the others (and succeeded). In the alternate future Crypt sent Lethal to, Kayo apparently was some kind of scheming corporate villain. Kayo is a confident fighter and covert operator, with a Generic Comic Book Japanese Sense Of Honour™. He’s logical and reserved, or so we are told. There seems to a scheming, calculating side to his personality, too. 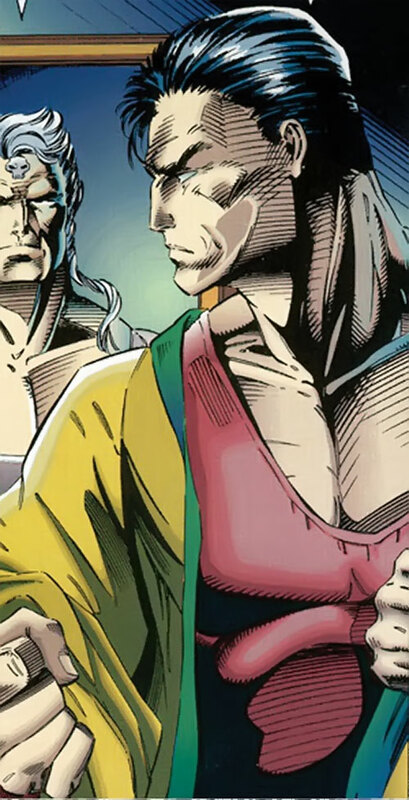 He was the one who pointed out to Battlestone that the Barros brothers had money and were ripe for recruitment given the tragedies they had just suffered. He also came across as reasonably patient and understanding. But that may be because just about everyone else was a gung-ho knucklehead. Like most Brigade characters, he’s easy to plug in as just another costumed merc. Language (Japanese), Schtick (Lightning Release). Dependants (unrevealed relatives in Japan). Whilst working with Battlestone, Boone and Lethal, Kayo’s usual kit was a Manrikigusari [BODY 04, EV 04 (05 w/STR, 08 w/Martial Artist), Extra limb: 05, R#02, Note: Can Be Thrown] and a Nunchaku [BODY 04, EV 04 (05 w/STR, 08 w/Martial Artist), R#02, Lightning Reflexes]. 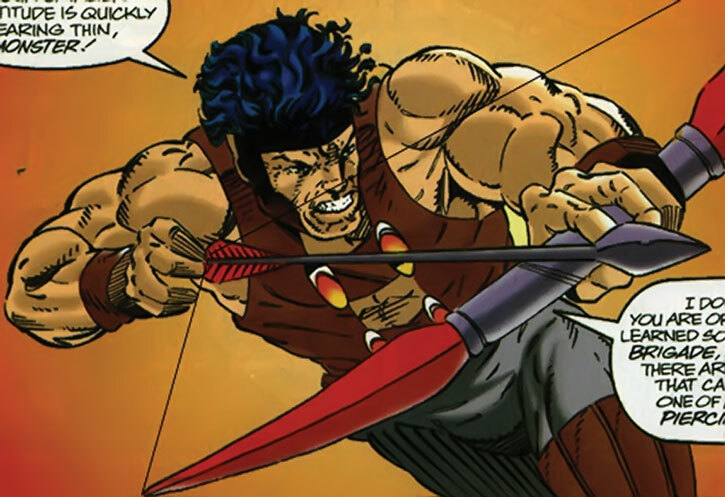 Longbow [BODY 05, Projectile weapon: 04, Ammo: 01, Rec. STR: 04, R#02, Bow Advantage (actual EV is 05, actual Range is 08, Limitation : Low Penetration]. Quiver [BODY 02, Projectile weapon: 04, Ammo: 20, Limitation : Ammunition load for the Longbow]. Armour-piercing arrows [BODY 02, Projectile weapon: 04, Sharpness (Projectile weapon): 02, Ammo: 05, Limitation : Ammunition load for the Longbow]. Shuriken (x16) [BODY 02, EV 03, Dart Bonus, Grenade Drawback].